The world is full of musical mutts, folk/pop concoctions, strange hybrids, mutations influenced by the west and seismic technological shifts, and with this, endangered traditions brought on by any number of factors: young people seeing them as “old,” fundamentalists decreeing them forbidden, and more. And then there are those places where traditions, in some ways far away from home, have managed to find cover, flourish, maintain nurturing by guiding hands, community, and perhaps even isolation. And the western hemisphere is chock full of the music of the displaced. We take it for granted. Yet, everything from deep Louisiana creole accordion, black shape note singing in the Florida panhandle, Colombian Cumbia, Puerto Rican mountain music found as far away as Polynesia, Garifuna rhythms along Central America’s Caribbean coastline, or Javanese gamelan thriving in the South American country of Suriname are a few examples. In Guyana, which is to this day a special department of France that borders Brazil, there are the descendants of former Surinamese slaves who fled that country, which borders Guyana to the west, and who have been holding onto traditions for hundreds of years. Musically, one would be forgiven for assuming these recordings, all taped between 2009 and 2014, had to come from Ghana or Benin. But the Bushinenge, who scattered into the amazon in the 18th and 19th centuries, creating their own cultural groups, languages, and hierarchies, are a product of South America as much as anything else. 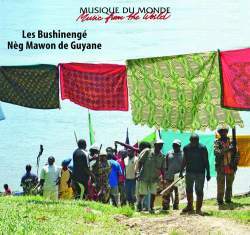 The music on this disc, recorded often but not always in the country’s coastal capital, Cayenne, thrives on radically syncopated drum rhythms, at times conjuring hints of Ewe drumming found in southeastern Ghana. (The call and response, bellowing out of Baptist churches throughout the southern US, has its roots in a similar spot as the Bushinenge.) But these various groups share the understanding that music links a complex web of human involvement, from spirituality to simple communication among individuals. Over the years, various horns, “thumb pianos,” lutes and bowed stringed instruments have all but died out, showing that things have indeed changed. Yet hand drumming and harmony vocals continue to flourish.